There's a great little tale on the Rapha website about how three quarter big shorts (knicks) came to be in the first place, which is typical of this highly detailed Brit brand. It's all part of the deal when you buy into the Rapha philosophy, somehow you're buying much more than just a pair on cycling shorts - it's almost like buying a Leica camera, it's an investment in yourself. I've been riding various 3/4 bibs for many years, even in mid winter I prefer these "cut-offs" over full length tights (on all but the coldest of days). They cover the essentials, yet hide away from ankle biting wet and mud, giving a more racy and cleaner feel to a ride - or at least they do for me. 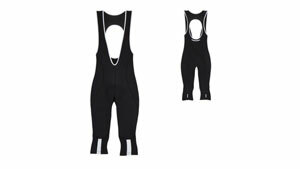 In the past I've tested many Rapha shorts, and at times have not been as wooed as I could be, at least not in comparison to their above the waist offerings - so how did these black beauties fare? To start with these all blacks are not quite all black, they come with a white knee "flash" on either leg, and the inner seams of the bib are also white trimmed - so there's no missing that Rapha statement you're wearing.The actual shorts, or 3/4 part of the "shorts" is made of high quality and stretchy "Thermoroubaix" fabric, which is quite thick and robust, with a comfy fleece like lining, The quality of the stitching is pretty fine too. The upper part of the bib is made from the same material, and sports a radio/i phone pocket in rear, while the actual straps are made from a mesh fabric. Inside the padding comes in the form of a bulky Cytech insert, which is well formed and fast drying, as are the shorts. In use they're a snug fit, so unless you're a racing snake I'd err on the larger side of things. Comfort is big, even if the padding feels a little bulky when stumbling around off the bike. Durability seems good too; I've worn them daily for 2 months - and washed them innumerable times (machine washed at 40 degrees), they are clearly a sold and comfortable garment. The bottom line - So far so good, clearly well stitched and made from quality material, a little on the skinny side when it comes to fit, but they do brightly outshine cheaper rivals. A great pair of shorts, at a price to match what you're buying into (US$245).